Combine parsley, garlic, chilli and breadcrumbs in a mini processor and pulse to combine. Add oil, season well, and pulse again until just combined. 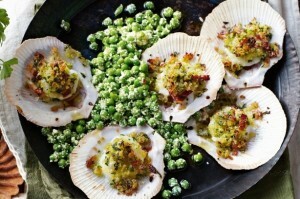 Place scallops in their shells on a baking tray and top with crumbs. Put peas in a pan of salted, boiling water for 2 minutes. Drain. Toss with parmesan and season. Keep warm. Grill scallops for 1-2 minutes until crumbs are golden and scallops are just cooked. Serve on a platter, scattered with parmesan peas.